Vote for Dr. Erich Longie, North Dakota House ! November 2nd don't forget to vote for Dr. Erich Longie, who is a candidate for the North Dakota State House of Representatives, District 23. He is president and co-founder of Spirit Lake Consulting, Inc., a technical services firm with headquarters on the Spirit Lake Nation, Fort Totten, ND. He was the first enrolled member of the Spirit Lake Dakota Sioux to earn a doctorate. to the University of North Dakota for his bachelors, masters and doctorate degrees. If you have not seen too much on our blogs lately, you know why. Erich has been on the campaign trail! As for me, I have been doing the usual statistical and technical stuff. We just had a paper on Ethics for Tribal Workers accepted for presentation at the Consortia of Administrators of Native American Rehabilitation meeting to be held in San Diego in December. As usual, we are working on getting new business - but that has been put on hold a little as Erich runs for election. Personally, I think it is exciting. I don't know how many Native Americans are in the North Dakota House of Representatives, but however many it is, it's not enough to provide the needed perspective on issues facing people on and off the reservations. "If these are the kind of people who are impressed with him, this Davis guy must really be something." Then, I met him. The funny thing is, no one had mentioned Willie used a wheelchair. His character - commitment, competence - stood out so much you kind of forgot the whole disability thing. It was really secondary. But let's talk about that because it does reveal something about his character. When he was a teenager, Willie was a pretty good athlete, all set to go off to the University of North Dakota. Then, he was in a car accident which left him paraplegic (I think that's the correct term). Correct term or not, the point is, many people in this situation would have used the excuse to feel sorry for themselves, blame other people or society for not being accessible, go on disability, stay home and that would be the end of it. I've seen the same story written that way many times. Well, I guess Willie didn't like the ending of that story so he wrote his own. He went to the University of North Dakota anyway and graduated. He had the usual jobs people have when they graduate, worked in administration at the tribal college, for tribal housing for a while. Then, he found his real calling working for the vocational rehabilitation program, helping young people move from high school to work or college. He became politically active, supporting getting his tribe to adopt the Americans with Disabilities Act. The Turtle Mountain Reservation implemented full inclusion of students in special education before it was required by law (thanks in large part to Gaylene Belgarde) and then the tribe followed a decade or so later by adopting ADA, in large part because of Willie Davis. "It's about the cause, not the applause." Whether it is for Native Americans or individuals with disabilities, Willie has always had that same ethic of working for the good of the people who is paid to serve and not to get more recognition or prestige for himself. When he received the Vocational Rehabilitation Counselor of the Year award he told me that he was a little embarrassed because he felt the award should rightly go to the whole program and recognize all of the people who worked for the tribal members. In years of working with Willie, he has always spoken with moral authority. He speaks the truth even when it might make people uncomfortable. His biggest issue has been getting people jobs - that's how he came to work with Spirit Lake Consulting, Inc., which has hired many people over the years on different reservations. 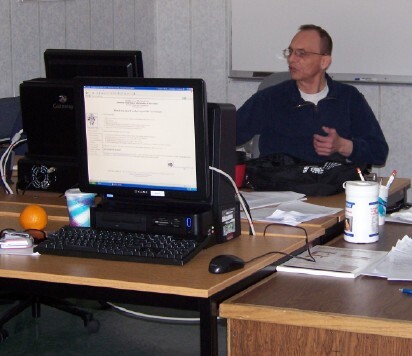 One of his interests in getting us to come to TMCC was that we would pay stipends to participants who were project testers, pay for meals at the college cafeteria - in short, bring business on to the reservation. Now, Willie is exploring business development opportunities for the reservation. Gee, someone who is honest, respected, hard-working, focused on bringing jobs. I don't know if America is ready for a person like that to hold public office - but I'd like to find out! "You keep saying that. I don't think that word means what you think it means." That was my favorite line from the movie, The Princess Bride, and it fits my experience with teaching and learning about generosity in business. To be honest, at first, I wasn't sure what Erich was talking about. Over the years, I've slowly learned that generosity is just as important a value as the others. In the long run, I only work with generous people. From day one, I totally understood how running a business takes courage - you have to step out from the safe job you have, quit being like everybody else drawing a paycheck and take the chance on failing. I see how courage is required. Perseverance - sure, you have to work a lot of hours, not quit the first time (or the second time) you don't get a contract, you get blindsided by some expense you didn't expect, an employee you really counted on leaves. But - generosity? Sure, it's good public relations if you donate to events in the local community. Being generous with your employees - in salary, in praise, in good working conditions - is a good way to attract and keep good people. If you come late, don't do your share of the work, spend your days on your cell phone while your co-workers pick up the slack, that's selfish. The opposite of generosity. It really hit me today, though, as I was talking to someone about a new joint venture we were considering. In putting together the proposed staff, I thought about a young man I know who is very bright and talented. Let's call him Bob. I didn't even suggest Bob as a possibility. Why? Because any project is all about him, what will Bob get out of it in money, recognition, future contracts. What's wrong with that? Isn't that what capitalism is about? Getting the most money you can? Isn't anything else being a sucker or just giving your work away? Well, there you are back to generosity. I think it is okay to give your work away. I write a blog on statistics that has (sometimes!) useful information, and I do it for free. I present at conferences, not for free any more, but for less than my normal rate. I do that because I attend conferences where it is possible for me to learn from other people. I read lots of useful web pages. I don't believe in just taking and never giving. "Isn't it fair then, that if it benefits you, you'd pay me a little bit for the referral for the newsletter guy, and since he's getting business, he'd pay me a little bit, too. I wouldn't charge that much, so I make some money, so do you and the newsletter guy. Everyone wins!" It sounds so logical, but it doesn't work that way. It is a waste of time. For an introduction that would take ten minutes to make, Bob needs to first be sure he gets an agreement from me to give him a cut, then he needs to get an agreement from the newsletter company. All of this extra effort from everyone is so that Bob's needs can be taken care of. Then, there are those times when there is no benefit to be had. If my client only has a certain amount of money in the budget and I need to test out some new software anyway, why not test it creating a cool survey for them? Why not use it to do some analysis of their data? Bob's answer would be that surely, they could find some way to pay for it. They could move money from customer service, classroom supplies, employee salaries or somewhere else so they could afford to pay him to do a better job for them. The thought of doing a better job at no cost to them, since it isn't costing him, wouldn't even come up, because it's all about Bob. It exhausts me even to think about having these conversations. Which is why, even though he is smart, educated and capable of doing great work, we're never hiring Bob.